Boston was founded on its harbor, and boats still carry people to the Harbor Islands, North Shore, South Shore, and even to Provincetown at the tip of Cape Cod. The islands in Boston harbor have walking paths, picnic areas, swimming beaches, camping areas, and even a Civil War fortress. If you have several summer days to spend in Boston and the weather is good, consider a half-day or day-long excursion to the islands. The Salem Ferry runs between Boston and Salem on the Massachusetts North Shore during the warm months, offering an attractive 45-minute maritime alternative to visiting Salem by Commuter Rail. In summer, both Bay State Cruises and Boston Harbor Cruises run fast ferries from Boston to Provincetown at the tip of Cape Cod. 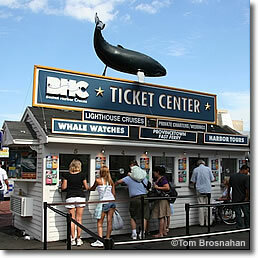 Boston Harbor Cruises ticket office on Long Wharf-South Pier near the Long Wharf Marriott Hotel and the New England Aquarium.